Youth Club Will Surely Close Without Your Support. At the time of writing only 400 people have signed an e-petition urging Warwickshire County Council to place the Youth and Community service in the category of first line protected services. Those who have signed believe the service must be saved. This is in recognition of the countless vulnerable young people who have been, and are being, protected from sinking in our society, blighted by social deprivation and being tempted into anti-social behaviour. If the Service is closed the cost to the County and the Government will be much more in providing custodial, social service and mental health facilities for those who will be neglected. In Henley itself the residents will notice immediately when the youth club is closed. I know of least 20 young people whose contact with the youth club has been instrumental in steering them away from the justice system thus removing the prospect of a Criminal Record blighting their lives. I have met youngsters whose home life drives them out on to the street who depend on the club as a home from home, a place where they feel secure and confident enough to share some of their most dreadful stories. I have shared stories which break your heart and fill you with admiration that this young man or woman is still resilient and still making good choices about their future. 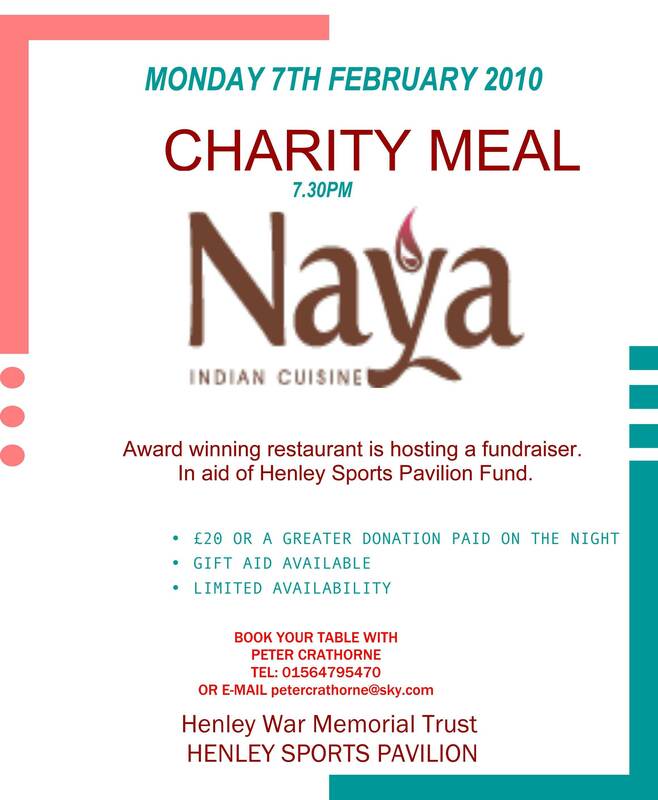 Residents of Henley, we simply cannot let our club close. To be effective our petition needs 1,000 signatures from each of the youth centres in Warwickshire; we need our County Councillors to receive 100s of letters, we need to garner every particle of news coverage before decisions are made in February. Please go to this link and sign up to save our essential community service. Parish Precept to go down by 10% in 2011! 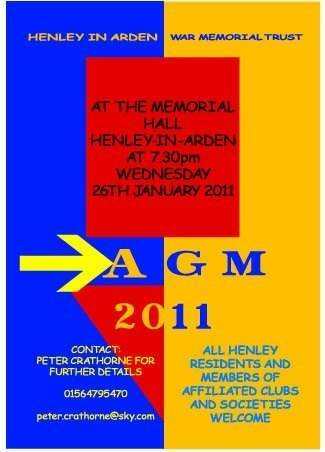 At their meeting held on 6th December 2010, Beaudesert and Henley in Arden Joint Parish Council voted to decrease the Precept for the town next year to £74,350 - a reduction of over 10% on the 2010 figure of £82,650. Eleven of the twelve Councillors, agreed to the 2011 figures which will be submitted to Stratford District Council at the end of the year. Chairman of the Joint Parish Council, Les Goodman, said "We are extremely pleased that we are able to pass on a significant saving to the tax payers of Henley in Arden - especially during the recession when most people's family budgets have been hit hard. We believe this is the first time in JPC history that a reduction in Precept has been made. We have secured the reduction due to efficiency savings in administration, including insurance and utilising discounts from on-line registrations with government bodies, together with substantial cost-savings on repairs and maintenance contracts. We wish to stress that the reduction in Precept does NOT mean that services will be cut or reduced as a result. We have worked really hard to maintain and improve all our services this year, and feel that the savings should be passed on to the public in return." Mike Willmott, Chairman of Democracy 2012, comments on next year's Joint Parish Council's Precept (Parish Council Tax) in his New Year message. DEMOCRACY 2012 will be offering voters in the May 2012 parish elections, new prospective parish councillors who will undertake to consult, listen to and represent the residents' wishes and concerns. GROUNDHOG YEAR arrives in Henley, as we are to repeat yet again the insensitive squandering of the precept on administration and the total inability of the council to reflect the views of the parishioners, particularly with regard to the cattle market development. Next year's reduction in the Parish Council Tax (Precept) will be £8,300, but only £3,500 comes from expenditure savings. The traditional areas of excessive expenditure will see no cutbacks. Salary costs will increase by 5.4%, making the total admin costs a massive 42.5% of the precept. Communications costs (propaganda) are up yet again, this year by an incredible 33% to fund more editions of the JPC Newsletter and the JPC's disappointing website. To fund the reduction, £150 will come from increased allotment rents and the balance of £4,650 will have to come from raiding the Parish Council's piggy bank (savings). This policy of deficit funding is not sustainable for future years. Clearly, the formulation of the JPC's budget follows the same principles as the last Labour Government of failing to match expenditure to income. This lost Labour the last election and will also probably be the downfall of the Ruling Group in May 2012. Democracy 2012 will continue to hold the council to account and point out whatever positive actions it can for the benefit of the parish council taxpayers. I wish all residents a very Happy New Year. Building Control - This department fails to see how 10% on-site renewable energy will be achieved. Environmental Health - No Development should take place until various works are completed. SDC Housing - STRONG OBJECTION raised to the Application. Warwickshire Police - Various recommendations. According to the SDC Planning Dept, the earliest date that the plans will go to Committee is the 16th February, failing that it will be the 9th March. Apparently there are likely to be some amendments to the plans and it is important to watch for notification of any changes, either via the press or the SDC website. It is unlikely that individual notifications of changes will sent out unless there are significant alterations to the plans. However, the JPC will receive notification of any changes and Henley NEWS looks forward to publishing the press release from the JPC about these changes, so that the residents can be fully informed." I cannot believe that in the 21st century a locally voted body can choose to ignore the local populations serious doubts against such a development. The size of the development will have such a significant effect on Henley that the failure to have a properly conducted public consultation verges on criminal. It appears that we have reverted back to medieval times with the JPC acting as the Lords of the Manor and the local population are merely seen as the serfs. Lip service is being provided by the JPC and their intention is clearly to steamroller this development through regardless of local feelings. When I see the actions of the JPC members over the last 12+ months I cannot but help think of this most appropriate of sayings “Too many clowns and not enough circuses” quite apt I think. The JPC should have rejected the planning application and then made their observations. The SDC are currently considering my official complaint about the conduct of the chairman of the JPC at the meeting of the committee on 6th December when I was treated with disrespect and prevented from commenting about the planning application in open forum. 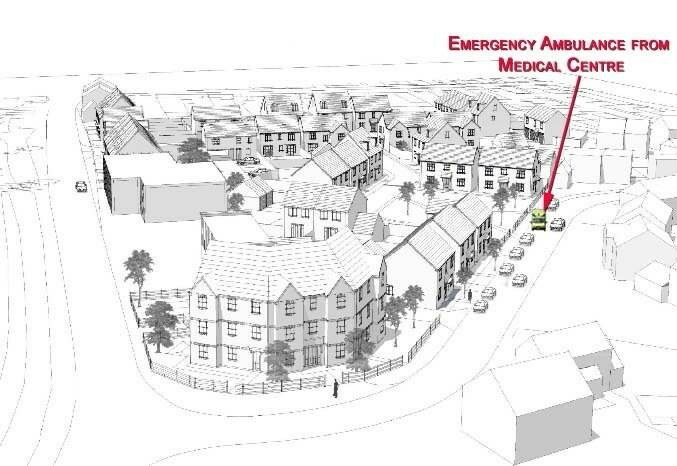 The design is of poor quality - Too many dwellings - Not enough parking for residents, which will generate on street parking from services, utilities and deliveries close to the traffic lights. OUTRAGED - Where is democracy in Henley???? The whole thing is wrong for Henley I sent my objections to SDC before I read what Henley News Online. I had written the same almost word for word. I do not support the proposed plans & think it is about time that the JPC took notice of the people's voice. After all, they are supposed to represent we who voted for them. It will be a sad day if the plans are approved. I think it's appalling that the JPC, who are elected by the people of Henley, feel above the voice of the people who elected them. 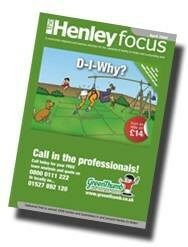 If only the people of Henley could call for a vote of no confidence as would happen in government! God help us! The Parish Council endorsed that! No wonder you want to change it [sic "the JPC"] and the sooner you do so the better. So it looks as if we'll have a stiff fight on our hands when this goes to committee, as to committee go it must if only because it's so large. Keep me abreast, please, of all developments. 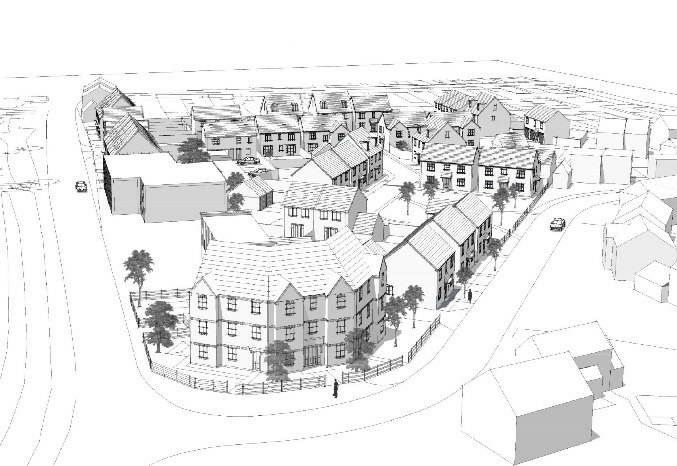 I am totally perplexed at the Parish Council's refusal to discuss or consider the proposals that I, as a parishioner and an architect with 50 years experience in housing design, expressed in my alternative plan. This work was done after careful observation and listening over a period of months. I could find nobody who welcomed the total eradication of the market. Although depleted, quite rightly, by the loss of the livestock, the retail side is still popular and this development was an excellent opportunity to make it work more efficiently on a smaller, tidier scale, incorporated within a housing development that would have more character and meaning, and retain the town heritage. It serves no beneficial purpose to reiterate that many other towns have lost their market, nor that our Parish Council had agreed it's inevitable demise - a defeatist philosophy. In the Beaudesert & Henley in Arden Parish Plan, section 7.8b) it promises -"The Parish Council will continue to pursue the long-term retention of the Market and to support infrastructure improvements relevant to that aim". It is reassuring that our District councillors and the District planners are prepared to take the observations in the alternative plan into consideration even if our more local representatives are not. NO to the recommendation of the JPC. The recommendation was ill thought through and did not take into consideration the objections put forward. Residents like myself need not have bothered to voice any opinions. It`s a great shame we have a majority of councillors led by a chairman who brushes aside any opinion that contradicts his own. I think the development will be detrimental to the future of the town, increased traffic, greater parking problems and greater pollution. Think again JPC before it is too late. Not all change is bad but change does need to be managed. Beaudesert and Henley Councillors voted to support the contentious development proposed for the Henley cattle market site with 16 conditions on Monday night....."
Cllr Matheou declined to advise councillors if he had complained to the Stratford Herald about their identical "misreporting". At the same meeting the JPC Chairman, Cllr Les Goodman, complained about Henley NEWS reporting of the objections by residents concerning the JPC's support for the planning application being anonymous. 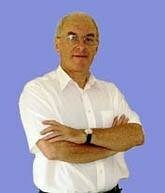 However, he failed to criticise SDC's planning website which carried many of the same objections all anonymously. The Chairman did not advise if he had complained to SDC about publishing anonymous statements. Communities across the county are being called upon to shout about their achievements in the last year. For the fourth year running Warwickshire Rural Community Council is once again organising a celebration and an opportunity to share ideas with other communities facing similar challenges. Anyone living in a village with 5,000 inhabitants or less is encouraged to enter. There are six categories to choose from – Community Projects, Community Buildings, Communication, Community Heroes (or businesses which benefit the community), Environment and History & Heritage – and all kinds of evidence are welcome (photos, DVDs, publications etc). 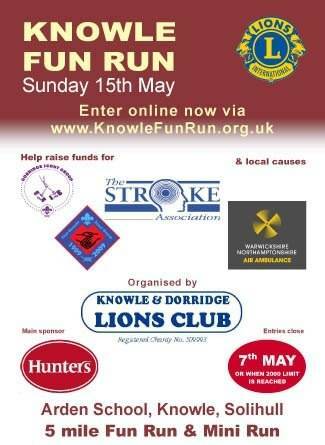 The closing date for entries is 30th June. A panel of volunteer judges will meet to consider the entries on a weekday in July and a celebratory event will be held in September, at which communities will be encouraged to exhibit and discuss their achievements. For more information about how to enter or to volunteer to be a judge, visit www.ruralwarwickshire.or.uk or telephone Ariadne on 02476 217390. Seasonal flu continues to be prevalent in Coventry and Warwickshire with over 1000 calls to Warwickshire’s GP out of hours service in the past week from patients with flu-like symptoms and 444 attendances at Coventry’s walk-in-centre with flu-like illness. Vaccination continues to be a key way of protecting against the illness. Whilst there are some local supply issues, local NHS services are working closely together to identify stocks and ensure they are available at GP practices for the over 65s, pregnant women and those in at risk groups such as asthma, diabetes or liver disease sufferers. With the health service under pressure at this time it is even more important to choose which service you use appropriately. As far as Accident and Emergency is concerned, if it's not, don't go: unless your situation really is an accident or a medical emergency, stay away from A&E where you will only delay treatment for other, more urgent cases and you put others at risk of infection. Pharmacies provide medicines and health advice to help with many illnesses and ailments including coughs, colds and flu. If your symptoms persist, you develop a secondary infection such as a chest infection and you are coughing up mucus, or you are concerned about particularly severe and worsening symptoms, contact your GP or use one of the local NHS walk-in centres. 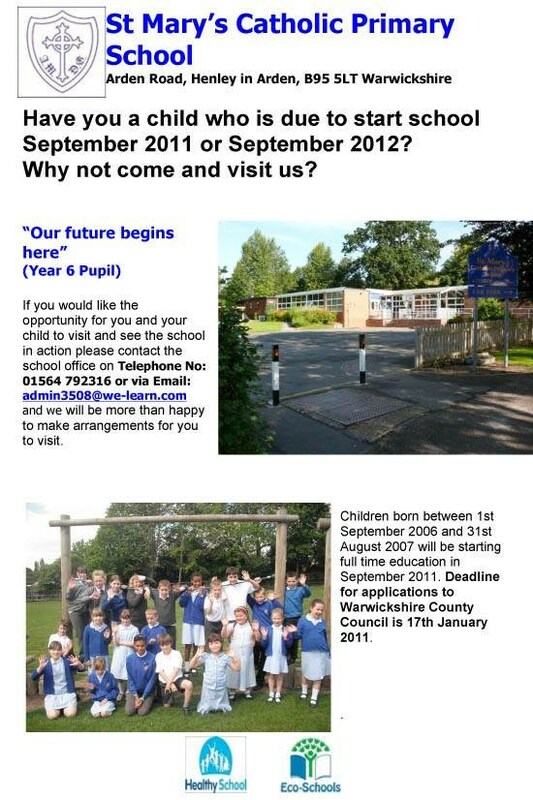 Parents are being reminded to get their applications in for pupils starting primary school in September. The application deadline is January 17. The process can be completed online at www.warwickshire.gov.uk/admissions, over the phone or on paper. Our Coalition Government has declared a policy for “The Big Society” and in our Covenant Service, when our pastoral visitors were allocated membership tickets for distribution, we were reminded by Helen Bell our minister that neighbourliness has always been an essential component of Christianity. Grand designs have their place but it is the little things that really make the difference, and taking an interest in our neighbour is the least we can all do. For February, Henley Churches Together will have a lunchtime meeting, “Time Out With God”, with soup, on Thursday 17th at 12.00 noon at St Johns Church. Our Sunday Services, all at 10.30am, are: 6th, Mrs Lesley Sergeant. 13th, Revd Helen Bell (Sacrament). 20th, Mr Telfryn Pritchard. 27th, Mrs Elizabeth Harrison. THE WEDNESDAY CLUB FOR VISUALLY IMPAIRED PEOPLE provides a friendly environment where people with visual problems can meet together and enjoy good company, interesting speakers, outings and a delicious tea together. The Club meets on alternate Wednesday afternoons and welcomes new members. For further information please phone: 0121-705-3926, 01564-792724, 01564-794209 or 01564-792138. Do you want to get fit after Christmas doing something different but need to keep the kids busy as well? We have the perfect solution. Indoor Cardio Tennis sessions for adults and indoor sports sessions for pre-school children at the same time for ONLY £1 each !! The new sessions will be held at Warwickshire College, Henley in Arden every Tuesday starting on 18th January 2011 from 11.15am – 12.00pm. Cardio Tennis is an adult fitness based tennis session for all standards including total beginners. Its an excellent way to get fit whilst having fun and with heart rate monitors available to measure how many calories you burn, what an excellent way to measure your fitness levels. Whilst Cardio Tennis is going on for the adults we will be running multi-skill sessions at the same time for pre-school children from 2 ½ yrs – 4 yrs. Multi-skills helps improve children’s co-ordination, footwork, balance and confidence at a young age. Each session is only £1 and adults can just do cardio tennis on their own without children or you can just bring the kids along to the multi-skills and not take part in cardio tennis. If you are interested in joining the sessions then please contact Neil Supperstone on 07912 66 44 26 or email neil@coolsportz.co.uk. Places will be allocated on a first come first served basis. Please visit www.coolsportz.co.uk to find out about all of the other sessions the club runs. 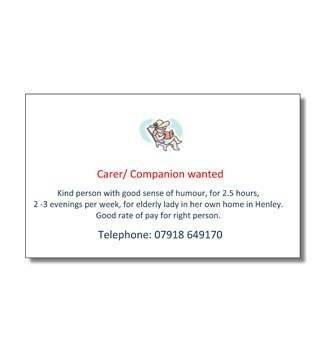 If you are involved with one of Henley's excellent organisations and need more volunteers, please advise Henley NEWS and we will publish an advert completely FREE. As we are read by most of the town, it will be seen by almost everybody! PLEASE JOIN US EVERYONE WELCOME. 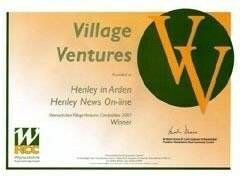 (DID YOU KNOW ALL HENLEY RESIDENTS ARE MEMBERS OF THE TRUST? The Trust, through its Management sub-committee, continues to update the Memorial Hall with the cost of the works and its running costs being met entirely from monies generated by lettings, supported by fundraising events. It can still call upon the Trust for financial support if required. The Memorial Hall is continuing with a conservation plan to reduce energy use in the future, has installed an entrance barrier to the car park to control unauthorised parking and started saving for a replacement heating system. The hall is almost fully booked and provides an excellent resource for the town. It caters for children with a nursery school and dance classes, the Flower Club, Women’s Institute, the Drama Society and a Badminton club. It is available to all residents and organisations for bookings at advantageous rates as well as some commercial lettings. The Memorial Sports Ground is now the responsibility of The Sites and Services Management Sub Committee. Licences, which are agreements between the clubs who use the playing fields and the Trust, are being revised to reflect the strengthening partnerships. Linking up with the Cricket, Table Tennis and Football Clubs, HWMT has maintained the momentum in proactively managing the sports pavilion and embarked with them on a journey that will see the building redeveloped, modernised and equipped to provide much improved facilities. There is a co-operative fund-raising project with the Lawn Tennis Association, the Tennis club and the HWMT to fund three new floodlit courts. This will make the Tennis Club one of the best in Warwickshire. The Shooting Club is redesigning the entrance area to better accommodate their disabled members. In a recent survey it was revealed that 361 adults and 274 young people take part in the activities of the six organisations that use the playing fields. The facilities are available to non sports club members who live locally with a small payment for specialist activities. The clubs are always recruiting, in particular the bowls Club needs more members. The Managing Trustees have reorganised the supervision of its finances with each section operating within an agreed budget which is reviewed by the Trustees quarterly. It has spent much of the past year revising its rules and is presenting an up to date version of them to this Annual General Meeting. There has been no change to its aims and objectives but its operating systems have been updated. The principal changes are to remove the name “Town Improvement Committee” from the rules replacing this with “Managing Trustees” and the redefining of membership of the trust to include all over 18 age residents of Beaudesert and Henley and registered members of all clubs, societies and organisations affiliated to the trust. For a full copy, please contact Peter Crathorne. It is producing a hand book for Trustees which will guide them through their responsibilities for this increasingly complex organisation. It is also planned to have a booklet for affiliates setting out their relationship and responsibilities to the Trust. It has carried out a review of the condition and needs of its land and properties which will now be done annually. The outcome of this is to draw up a plan of urgent short term projects which need doing during the year, a medium term improvement plan and a long term strategy for upgrading its resources which will also be reviewed annually. It has set out a scheme to give sporting bursaries to young people who may not be able to afford the cost of their chosen sport. This is designed to increase opportunities for participation as well as nurturing potential talent. It is presently seeking financial support for this. 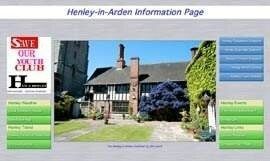 The Trust continues to support the Henley-in-Arden Town Website at: www.Henley-in-Arden.org. The trust is grateful to The Joint Parish Council for its continuing financial support. The Trust is now a vibrant and progressive organisation serving the town well. Please support it. Many thanks to the people who work so hard in their organisations and for the Trust itself; your hard work has given us a brilliant year setting firm the foundations for further growth and development next year. Claverdon were back in league action after the Christmas break with a tricky fixture away at Coventry Tech. With a near full squad to choose from the lions were able to field a very strong team. The lions started the game showing no signs of the break and with quick passing from the backs they were soon on the score sheet. Centre Tom Bennett collected the ball out wide and used his pace to jink his way past 3 players to score under the posts. Doz Ward easily converted. Cov Tech pressed Claverdon straight after their first score but resolute defending from Chris Lowe and Scott Conduit kept the hosts firmly at bay. With only 15 minutes played Claverdon scored their second try courtesy of winger Paul Daws. A break saw the visitors deep in the opposition half and with the Cov Tech defence not set, Doz Ward found Daws on the overlap for him to score in the corner; Ward converted. 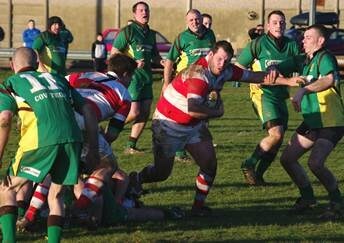 The Claverdon scrum was dominating thanks to the front three of Steve Grimsley, Dave Carruthers and Tim Harrison. It was from a scrum that the visitors scored their third try. A clever chip from scrum half Conor Smith caught the Coventry defence flat footed. Pace man Tom Johnson playing at inside centre was first to react and he took the ball at full speed to score a converted try under the posts. With little of the first half remaining, scrum half Conor Smith scored the crucial bonus point try with clever handling from forwards and backs to again go in under the posts. Ward made it 4 from 4 with the conversion. The second half was barely under way before the lions notched their first points of the half. A clever run from Doz Ward found a gap in the Cov Tech defence and he drew his man before offloading a looped pass to Tom Johnson. 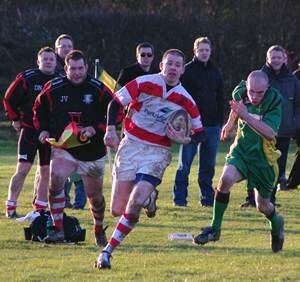 He made no mistake to outpace the full back and score under the posts with Ward again converting. It was then turn for winger Paul Daws to score his second. Great pace and quick hands caught the Coventry defence cold and when the ball was shipped wide to Daws he easily out paced his opposite man to score in the corner. Ward narrowly missed the touchline conversion. Such was the strength in depth of the squad, Jean Visser came on to replace Conduit in a like for like swap. He made an instant impact and helped move Claverdon deep in to the hosts' half. With Cov Tech struggling to contain the immense pressure, the ball found its way to flanker Andy Wenborn who went over for a score in the corner. Ward’s conversion fell just short. Almost immediately Claverdon were back in the Coventry half. With quick phases of play from the forwards and a strong run from Johnson, the hosts could do little more than concede a penalty 15 yards out. Quick thinking from Conor Smith saw him tap the penalty and accelerate past two defenders to score his second of the game. Ward converted. The last 10 minutes saw Ward replaced by Duncan Nealon and Claverdon score their ninth try of the game. Clever handling and passing out of the tackle ended with the ball in the hands of Jean Visser who easily ran in his first try of the season in the corner. With Ian Wyllie stepping up to the kicking duties, his conversion fell just short. The dying minutes of the game saw Coventry attack with intent. As has been the case all season, the lions defence stood firm and managed to keep the hosts at bay with another shut out. Claverdon’s fixture is still to be confirmed for Saturday and they will look to test themselves against higher league opposition. Burglaries remain low in the Alcester North Area, although residents are reminded to remain vigilant, particularly in the Tanworth in Arden area where most of the recent burglaries have been recorded. Vehicle Theft and Theft from Motor Vehicles remain low, although their have been incidents recorded in Henley and Claverdon whereby unknown offenders have gained access to vehicles without force and made an untidy search without taking anything. In all cases owners were sure their vehicles were secured on leaving them, residents are encouraged to report any suspicious activity ASAP so that local officers can make enquiries and take appropriate action. Overall since April the 1st burglary dwellings have reduced on the Alcester North area by -17.7% when compared to the same period last year and vehicle crime has reduced by -15%. Criminal Damage incidents have reduced significantly when compared to previous months this year. Most of the incidents have been recorded in the Studley area with a number of windows to commercial properties being smashed. Anti Social Behaviour has increased slightly on last year, this is partly due to calls regarding youths throwing snowballs at windows. Overall most of the incidents are recorded in Studley, with reports of rowdy youths and some drink related issues in the High Street near to Tesco Express and Crooks Lane areas. Officers are keeping incidents to a minimum through increased patrols in ‘hotspot’ areas, whilst continuing to make effective use of the Dispersal Zone and Alcohol Restriction Zone. Residents are encouraged to continue to report incidents of anti social behaviour as soon as they occur so that officers can attend ASAP and deal with the offenders accordingly. Violence has increased slightly on last year with most of the incidents recorded in the Henley and Studley areas. Those recorded are of a minor nature and have been dealt with appropriately by officers. Information & Advice - Driving in hazardous conditions! Be prepared for the road conditions to suddenly change over short distances. Avoid braking, sharp turns or sudden speed increases which could make your vehicle skid. The best way to slow without skidding is to get into a lower gear earlier and let your speed reduce and then brake gently. If you start to skid, take your foot off the accelerator. Do not brake suddenly. When moving off on a slippery surface, use the highest gear that you can (for example, second gear rather that first). This will help avoid wheel spin that could make you lose control of your vehicle. Please note it is an offence to let off fireworks after 11pm except on Bonfire Night when the deadline is midnight and New Year’s Eve at 1am. Anti Social Behaviour, Pool Road/Crooks Lane, Studley - 8 x targeted high visibility patrols and test purchases in relation to underage alcohol sales. Targeted patrols completed with reduced anti social behaviour in the area and fewer incidents reported. Agreed Completion 16th December 2010. Parking outside One Stop/Co-op, Henley High Street – 12 x targeted patrols to give advice to drivers parking dangerously. Targeted patrols completed with 54 vehicles issued with Police Warning Notices. The Safer NEIGHBOURHOOD Team has liaised with Stratford District Council as parking on double yellow lines is their responsibility. The District Council has promised an increased presence in the form of Traffic Wardens in the area who will issue on the spot fixed penalty fines for vehicles committing offences. The District Council has requested the support of the Safer NEIGHBOURHOOD Team in order to minimise vehicles committing offences in the area. The priority has been extended and will form one of the community priorities set on the 16th December 2010. Speeding in Claverdon B4189/Langley Road – 8 x targeted speed checks to be carried out with advice and/or enforcement where appropriate. Targeted speed checks completed with Warning Letters and Fixed Penalty Notices issued where appropriate. Liaison with Warwickshire County Council with regard to the possibility of installing flashing signs in the area. Liaison with the local community with regard setting up Community Speed Watch in Claverdon. Agreed Completion on the 16th December 2010. New Year Celebrations went well on the Alcester North Area with no major incidents reported to the police. The next Community Forum will be held on 16th December, 7pm, Wootton Wawen Village Hall. If you have a specific concern then come along to the local surgery where you will be able to speak to your local Safer NEIGHBOURHOOD Policing Team, Warwickshire County Council or Stratford District Council Officer. The next Henley Community Surgery will be held on 26th January, 11:30am, Henley Baptist Church Hall. The surgery gives you the opportunity to speak to members of the Parish Council & Safer NEIGHBOURHOOD Policing Team about the issues that concern you, while giving you feedback regarding what is happening in the community. The next Henley Police Surgery will be held on 19th January, between 11am – 1pm, Henley Police Station - A drop in facility to discuss issues/problems within the community with your local policing team. Not you of course, nor me – but it seems a lot of people do. The 2008 Recruitment and Retention Survey found that a quarter of UK businesses, when they performed background checks, discovered that applicants had lied on their CV. You may recall a recent episode of The Apprentice where a 21-year-old entrepreneur faced the wrath of Milud Sugar after the interviews revealed that he hadn’t been entirely truthful on his application. Sugar fired him for overstating, i.e. 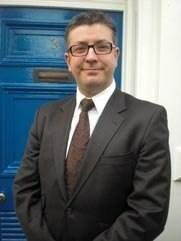 lying, about government licensing for his Isle of Man telecoms business. What an idiot! Such lies can easily be exposed by anyone taking the trouble to check. There was a similar case in a previous series where a candidate lied about having a degree when in fact he hadn’t; that’s really easy to check. As an employer it’s important to ensure that the perfect candidate you think you are about to take on is who they say they are. You must gain consent from candidates to collect information on them for background screening purposes. They’ll need assurance that all this will be treated as strictly confidential. Failure to do so will result in a breach of Data Protection laws. The important things to check are the name of the establishment attended, the course details and the title and classification of the qualification. It is remarkably easy to obtain a fraudulent degree or diploma from illegal organisations and at very little cost. You can use an online database such as www.accredibase.com to verify that these are not bogus. Following the interview stage you will want to obtain references from previous employers and follow up any particulars regarding employment history. Always contact the candidate’s employer directly and don’t rely on contact details provided by the candidate themselves. Look at the personal profile including hobbies & interests. Now look at the person; does one match the other? People tend to embellish their CVs hoping that by listing activities that appear to support their application they will improve their chances. Try a bit of probing to clear up any discrepancies. If the role you are recruiting for requires work with sensitive data or vulnerable members of the public it may be necessary to perform a criminal records (CRB) check. You can do this through www.warwickshire.gov.uk/crb. In the year when Warwickshire residents will see their television signals switched over to digital, Warwickshire County Council Trading Standards Service is warning residents not to be taken in by rogue traders who may take advantage of the switchover to sell consumers over priced or unnecessary equipment, door to door. In the Central Television Region, covering Warwickshire and many surrounding counties, switchover from an analogue signal to a digital signal is due to begin on 30th March 2011. Over the course of the year, the existing analogue television signal will be switched off and viewers will need to convert or upgrade their TV equipment to receive digital signals and a TV service. Not only are Trading Standards Officers concerned that rogue traders may attempt to sell residents unnecessary digital TV equipment but that some may use the opportunity to falsely claim their property requires other work doing, for example roofing or guttering work, something a rogue trader may point out if they are 'installing' a new aerial. In the land of fruit and vegetables the tomato is one of the kings of pollution. Unless you grow your own tomatoes without artificial heat the tomato usually has a huge carbon footprint. 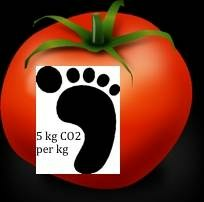 Typical shop supplied ordinary tomatoes have a carbon footprint of around 5 to 6 kg CO2 per kg of tomatoes. This is 5 to 20 times more than the humble carrot which clocks up a mere 0.25 kg CO2 per kg when raw and about 0.5 to 1.0 kg when boiled (the 0.5 kg corresponding to simmering in the minimum of water and the 1.0 to boiling vigorously in lots of water). Ordinary tomatoes out of season are bad enough, but specialist tomatoes, such as cherry, cocktail, plum or beef, use even more energy (not just the sun) to grow and ripen. These typically clock up 30 kg of CO2 per kg of tomatoes. However, in season in July, organic UK sourced tomatoes have a footprint of just 0.4 kg per kg, just a little more than raw carrots. So if you have a tomato habit like me, consider substituting carrots in winter. Carrots brighten up a plate of food and are nutritional heroes; they store a goldmine of nutrients. No other vegetable or fruit contains as much carotene as carrots, which the body converts to vitamin A. This is a truly versatile vegetable and an excellent source of vitamins B and C as well as calcium pectate, an extraordinary pectin fibre that has been found to have cholesterol-lowering properties. 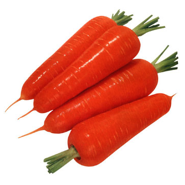 For more information about the nutritional values of carrots click here. So henceforth, I shall eat more carrots in winter and look forward to the UK tomato season from July to October. Stratford District Council's waste collection service was unfortunately disrupted by the recent extreme weather. We would like to apologise to those residents who have been affected by this over the Christmas period and for any confusion that may have arisen as a result of this and the revised collection dates that were necessary as a result of the national holidays. The changes to our normal collection schedule as a result of the festive season were decided in April 2010, and this information was circulated to all residents with their Council tax information earlier in the year, as well as being publicised on the Council’s website, in the Council’s publication Stratford View distributed in November and released through the local newspapers in the weeks before Christmas. The arrangements were that no collections were to be made on Monday 27th December and the crews would then collect each settlement 1 working day later than normal and then extend the first week of January to include a Saturday collection so that normal collections could resume from Monday 10th January. As a result of the recent adverse weather conditions many local authorities across the UK have had problems providing a full waste collection service, and although we worked closely with our contractors, Verdant, to respond to the conditions during this period, we were forced to suspend or limit services in certain areas. Main routes were gritted by the County Council whereas the majority of other roads were not. The safety of the collection crews, our residents and their property are the deciding factors in how to run the service. Following regular checks, decisions on how to provide the service were made daily and during the worst conditions we were forced to suspend the service entirely for three days before continuing a reduced service as conditions began to improve. Collections resumed in entirety from 30th December. Because the difficulties with safely accessing properties were so widespread, and unlikely to improve within a few days, it was decided that any properties missed on their scheduled collection would be rectified on their next scheduled collection. Any residents whose bins were not emptied as a result of the weather and road conditions will be able to put out up to 3 sacks of additional general waste for their next scheduled collection. Residents who missed a recycling collection are able to put out additional recycling in plastic or cardboard boxes next to their blue-lidded recycling bin. We have endeavoured to keep the public informed by providing updates on the Council's website and issuing press releases to local radios and newspapers over this period of disruption. Because of the festive season, it proved difficult to ensure these were updated as quickly as we would normally desire, and it is as a result of this conflict of extreme weather and festive holidays that any confusion may have arisen and for which we apologise. We would like to thank our residents for their support and reassure them that services should be back to normal from next week. 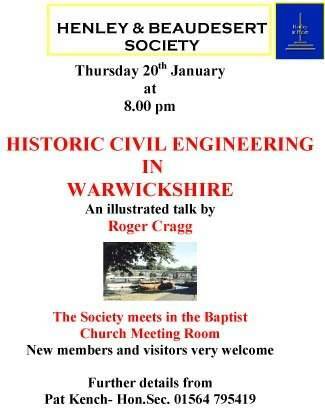 Our next meeting is on Thursday 20th January in the Baptist Church Hall at 8.00 pm when Roger Cragg will give a talk on 'Historic Civil Engineering in Warwickshire'. Visitors and new members are very welcome. Further details from Pat Kench on 795419. Brighten up the dark winter evening on Tuesday January 18th, come to the Baptist Church Hall to hear Pam and Paul Bollers presentation ‘One of the Costas (Rica)’. Visitors are welcome (2.00). 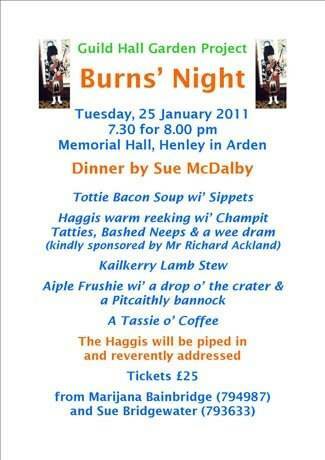 Ullenhall village hall January 25th 7.30pm. Speaker is Celia Davis ‘Plants for Butterflies and Moths’.